A categorization has been proposed of the welded joints depending on the type and character of loading and the needed safe- ty requirement of the structure of which they are an integral part. Four “production requirement grades”: “PRGs”, have been intro- duced. They allow the objective grading of welding requirements put forward towards the preparation of each and every welded joint for which the loading and operation conditions are familiar. The study investigates the formation of the diffusion layers and their properties on carbon steels after saturation with boron and vanadium in pastes. Metallographic analysis was performed with the use of the optical microscope “Neophot -21”. Microhardness was determined by tester PMT-3M. X-ray spectral analysis was carried out by the electron scan microscope JSM-6510LV JEOL with microanalysis system INCA Energy 350. Simultaneous Thermal Analysis (STA) unifies the simultaneous application of thermogravimetry and differential scanning cal- orimetry to one and the same wood sample in a single instrument, under perfectly identical conditions – same atmosphere, gas flow rate, pressure, heating rate, thermal contact, etc. A new thermal analysis approach to distinguish between the flaming and glowing combustion of wood was discussed. The results obtained by STA were used in a new way, to reveal the influence of plasma-aided capillary impregnation on thermal decomposition and glowing of wood controlled by oxygen and nitrogen containing flame retardant. New integral criteria of thermal behavior and decomposition such as specific enthalpy change, and specific heat flux or heat release rate, have been developed by investigat- ing three species rain-forest wood (Mérida, Yucatán) – Mexican white cedar (Cupressus Lusitanica); Caoba mahogany (Swietenia macro- phylla); and Tzalam (Lysiloma bahamensis). Geometrical synthesis of fine-module ratchet toothing in which the contacting surfaces of the teeth formed by the straight segments are considered. The proposed profile of fine-module ratchet teeth allows increasing the load capacity and manufacturability production. The formulas for determination of the main geometrical parameters of the proposed fine-module ratchet teeth are obtained. Since diffusion bonded joint is formed from atomic migration across an interface without a liquid phase, the interface is homogeneous microstructure and hence mechanical properties are not different from those of the matrix metal. However, it is not easy to control process variables at high temperature. This paper presents diffusion bonding process and a machinery with tool material selection to develop diffusion bonding press machine for joining complex contoured metals using hot forming and diffusion bonding technology. 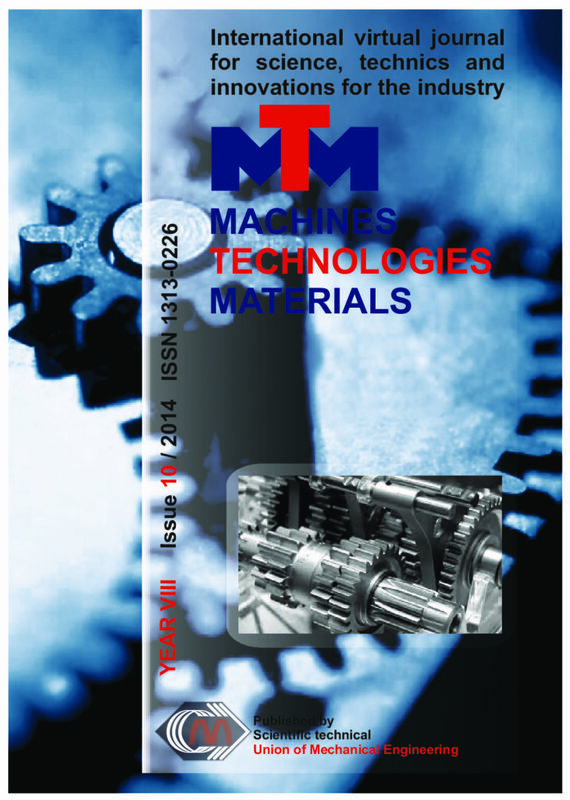 The article presents experimental investigations on the effect of cooling and lubrication conditions of the cutting zone on the surface texture after high speed milling of stainless steel 1.4301 and C45 steel in a wide range of cutting parameters. In the study three methods of cooling and lubrication were used: cooling with emulsion, minimal cooling and lubrication (MQL) and without emulsion – dry milling. The methodology and techniques of studies as well as their results and analysis of the effects of the investigated factors (conditions of cooling and lubrication and cutting parameters) on the geometric structure of the machined surface are presented. Conclusions regarding the impact of cooling and lubrication modes together with cutting parameters on the values of the analyzed surface parameters as well as their application recommendations are given too. Numbers of both ferrous and non-ferrous bimetal productions and applications have been increased due to useful advantages. Bimetal fabrication techniques and procedures are developing and getting various. Liquid metal based techniques are in basic bimetal fabrication methods which have two types; liquid-solid and liquid-liquid processes. Lost foam casting technique can be successfully employed for both liquid-solid and liquid-liquid bimetal composite productions. In this work, A380 and A2014 aluminium alloys were used to produce bimetal structure by conventional lost foam casting with liquid-liquid process. There are two main principles of liquid-liquid process. First, both alloys are joined in liquid phase and solidified and second, crucibles tilting are carried out synchronously at the same time. HB hardness of the cast specimens were measured and micro structure of the joint field were observed. Metal/metal composites are a group of promising composite materials with high developing and service potential. Especially in many fields they can be a powerful low cost alternative to metal/ceramic composites. The most commonly encountered type of these composites is steel reinforced aluminium matrix composites which stand out with high wear and abrasion resistance. Significant fabrication processes of metal/metal composites are based on liquid metal techniques. In this study, Al/steel composite specimens were produced by using vacuum assisted solid mould investment casting technique. A380 aluminium casting alloy were infiltrated into steel preforms, which were produced with H13 hot-work tool steel turnings, in the plaster based solid investment casting moulds. Micro structure observations, HB hardness measurements and XRD, EDS analysis were carried out for characterization. The experimental analysis of passive heat transfer intensification in the case of plate heat exchanger has been carried out. The passive intensification was obtained by a modification of the heat transfer surface, which was covered by a metallic porous microlayer. The experiment was accomplished in two stages. In the first stage the commercial stainless steel gasketed plate heat exchanger was investigated, while in the second one – the identical heat exchanger but with the modified heat transfer surface. The direct comparison of thermal and flow characteristics between both devices was possible due to the assurance of equivalent conditions during the experiment. Equivalent conditions mean the same volumetric flow rates and the same media temperatures at the inlet of heat exchangers in the corresponding measurement series. Experimental data were collected for the single-phase convective heat transfer in the water-water and water-ethanol configuration. The heat transfer coefficients were determined using the Wilson method.